Comprising 2 x retail units and an apartment overhead. Extending to approximately 335 sq.m (3,605 sq.ft.) in total. Belmullet is a village in Co. Mayo. 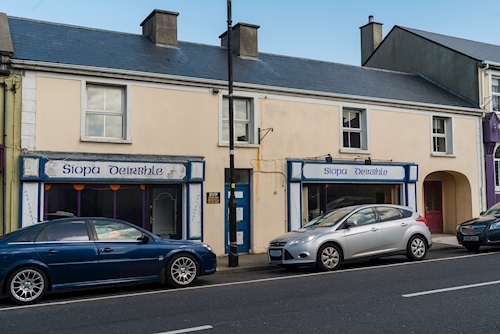 It is situated approximately 62km west of Ballina and 76km north west of Castlebar. Transport links are provided by the R313 road which provides direct access to the N59 national road. The property is situated on American street, close to its intersection with Main Street and The Square. Surrounding occupiers include Bank of Ireland, The Corner House bar and Bistro Rioga. The property is arranged over ground floor and first floors to provide a mixed use building. Internally the property comprises 2 x retail units and an apartment overhead.